This article is about the modern Frisians. For the ancient Germanic tribe also called Frisians, see Frisii. The Frisians are a Germanic ethnic group indigenous to the coastal parts of the Netherlands and northwestern Germany. They inhabit an area known as Frisia and are concentrated in the Dutch provinces of Friesland and Groningen and, in Germany, East Frisia and North Frisia (which was a part of Denmark until 1864). The Frisian languages are still spoken by more than 500,000 people; West Frisian is officially recognised in the Netherlands (in Friesland), and North Frisian and Saterland Frisian are recognised as regional languages in Germany. The ancient Frisii enter recorded history in the Roman account of Drusus's 12 BC war against the Rhine Germans and the Chauci. They occasionally appear in the accounts of Roman wars against the Germanic tribes of the region, up to and including the Revolt of the Batavi around 70 AD. Frisian mercenaries were hired to assist the Roman invasion of Britain in the capacity of cavalry. They are not mentioned again until c. 296, when they were deported into Roman territory as laeti (i.e., Roman-era serfs; see Binchester Roman Fort and Cuneus Frisionum). The discovery of a type of earthenware unique to 4th century Frisia, called terp Tritzum, shows that an unknown number of them were resettled in Flanders and Kent, probably as laeti under Roman coercion. From the 3rd through the 5th centuries Frisia suffered marine transgressions that made most of the land uninhabitable, aggravated by a change to a cooler and wetter climate. Whatever population may have remained dropped dramatically, and the coastal lands remained largely unpopulated for the next two centuries. When conditions improved, Frisia received an influx of new settlers, mostly Angles and Saxons. These people would eventually be referred to as 'Frisians', though they were not necessarily descended from the ancient Frisii. It is these 'new Frisians' who are largely the ancestors of the medieval and modern Frisians. By the end of the 6th century, Frisian territory had expanded westward to the North Sea coast and, in the 7th century, southward down to Dorestad. This farthest extent of Frisian territory is sometimes referred to as Frisia Magna. Early Frisia was ruled by a High King, with the earliest reference to a 'Frisian King' being dated 678. In the early 8th century the Frisian nobles came into increasing conflict with the Franks to their south, resulting in a series of wars in which the Frankish Empire eventually subjugated Frisia in 734. These wars benefited attempts by Anglo-Irish missionaries (which had begun with Saint Boniface) to convert the Frisian populace to Christianity, in which Saint Willibrord largely succeeded. Some time after the death of Charlemagne, the Frisian territories were in theory under the control of the Count of Holland, but in practice the Hollandic counts, starting with Count Arnulf in 993, were unable to assert themselves as the sovereign lords of Frisia. The resulting stalemate resulted in a period of time called the 'Frisian freedom', a period in which feudalism and serfdom (as well as central or judicial administration) did not exist, and in which the Frisian lands only owed their allegiance to the Holy Roman Emperor. During the 13th century, however, the counts of Holland became increasingly powerful and, starting in 1272, sought to reassert themselves as rightful lords of the Frisian lands in a series of wars, which (with a series of lengthy interruptions) ended in 1422 with the Hollandic conquest of Western Frisia and with the establishment of a more powerful noble class in Central and Eastern Frisia. In 1524, Frisia became part of the Seventeen Provinces and in 1568 joined the Dutch revolt against Philip II, king of Spain, heir of the Burgundian territories; Central Frisia has remained a part of the Netherlands ever since. The eastern periphery of Frisia would become part of various German states (later Germany) and Denmark. An old tradition existed in the region of exploitation of peatlands. Though impossible to know exact numbers and migration patterns, research has indicated that many Frisians were part of the wave of ethnic groups to colonise areas of present day England alongside the Angles, Saxons and Jutes, starting from around the fifth century when Frisians arrived along the coastline of Kent. Studies have found the DNA of people tested in Central England to be "indistinguishable" from that of Frisians. Frisians principally settled in modern-day Kent, East Anglia, the East Midlands, North East England, and Yorkshire. Across these areas, evidence of their settlement includes place names of Frisian origin, such as Frizinghall in Bradford and Frieston in Lincolnshire. Similarities in dialect between Great Yarmouth and Friesland have been noted, originating from trade between these areas during the Middle Ages. Frisians are also known to have founded the Freston area of Ipswich. In Scotland, historians have noted that colonies of Angles and Frisians settled as far north as the River Forth. This corresponds to those areas of Scotland which historically constituted part of Northumbria. As both the Anglo-Saxons of England and the early Frisians were formed from largely identical tribal confederacies, their respective languages were very similar. Old Frisian is the most closely related language to Old English and the modern Frisian dialects are in turn the closest related languages to contemporary English, together forming the linguistic category of Anglo-Frisian. North Frisian, spoken in the German region of North Frisia (within the Kreis of Nordfriesland) on the west coast of Jutland. Of these three languages both Saterland Frisian (2,000 speakers) and North Frisian (10,000 speakers) are endangered. West Frisian is spoken by around 354,000 native speakers and is not threatened. 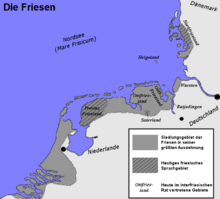 Today there exists a tripartite division of the Frisians, into North Frisians, East Frisians and West Frisians, caused by Frisia's constant loss of territory in the Middle Ages. The West Frisians, in general, do not necessarily see themselves as part of a larger group of Frisians, and, according to a 1970 poll, identify themselves more with the Dutch than with the East or North Frisians. Therefore, the term 'Frisian', when applied to the speakers of all three Frisian languages, is a linguistic, ethnic and/or cultural concept, not a political one. ^ "Die friesische Volksgruppe" (in German). Minderheitensekretariat der vier autochthonen nationalen Minderheiten und Volksgruppen. Retrieved 22 March 2019. ^ Minahan, James (2000). One Europe, Many Nations: A Historical Dictionary of European National Groups. Greenwood Publishing Group. p. 264. ISBN 0313309841. Retrieved 30 March 2019. The Frisians are a Germanic people with historical and linguistic ties to the English,* Dutch, and Germans. * Closely related to the ancient Anglo-Saxons, the Frisians have maintained their unique culture from the time of Roman control in northern Europe, in all over 2,500 years. ^ "Frisia". Encyclopædia Britannica Online. Retrieved 16 April 2019. Frisia is the traditional homeland of the Frisians, a Germanic people who speak a language closely related to English. ^ Potter, Timothy W.; Johns, Catherine (1992). Roman Britain. Exploring the Roman world. Berkeley: University of California. p. 190. ISBN 9780520081680. ^ Looijenga, Jantina Helena (1997), "History, Archaeology and Runes", in SSG Uitgeverij (ed. ), Runes Around the North Sea and on the Continent AD 150–700; Texts and Contexts (PhD dissertation) (PDF), Groningen: Groningen University, p. 30, ISBN 978-90-6781-014-2 . Looijenga cites Gerrets' The Anglo-Frisian Relationship Seen from an Archaeological Point of View (1995) for this contention. ^ Herbermann, Charles, ed. (1913). "St. Willibrord" . Catholic Encyclopedia. New York: Robert Appleton Company. ^ Schulz, Matthias (16 June 2011). "The Anglo-Saxon Invasion: Britain is More Germanic than It Thinks". Spiegel Online. ^ "The History of the Frisian Folk". ^ Weale, Michael E.; Weiss, Deborah A.; Jager, Rolf F.; Bradman, Neil; Thomas, Mark G. (2002). "Y Chromosome Evidence for Anglo-Saxon Mass Migration". Molecular Biology and Evolution. 19 (7): 1008–1021. doi:10.1093/oxfordjournals.molbev.a004160. PMID 12082121. ^ Homans, George C. (1957). "The Frisians in East Anglia". The Economic History Review. 10 (2): 189–206. JSTOR 2590857. ^ "The Frisians, their tribes & allies". ^ Frisian Place-Names in England. PMLA. January 1918. ^ "How I came face-to-face with East Anglia's 'twin'". ^ Kortlandt, Frederik (1999). "The origin of the Old English dialects revisited" (PDF). University of Leiden. ^ "Die friesische Volksgruppe in Schleswig-Holstein" (in German). Diet of Schleswig-Holstein. Retrieved 4 August 2011. ^ Matras, Yaron. "Frisian (North)". Archive of Endangered and Smaller Languages. University of Manchester. ^ Tamminga, Douwe A. (1970). Friesland, feit en onfeit [Frisia, 'Facts and Fiction'] (in Dutch). Leeuwarden: Junior Kamer Friesland. "Frisians" . Encyclopædia Britannica. 11 (11th ed.). 1911.